One of the more interesting and exciting aspects of LED lighting technology is the versatility displayed by this rapidly expanding form of lighting. With their small size, low power requirements, low heat production and tightly focused light spectrum characteristics, LEDs are proving extremely effective in an incredibly wide range of applications. LEDs are being applied to everyday applications in household lamps, flashlights, automobiles, boats and landscape lighting systems with a great deal of effectiveness. We are now seeing LEDs being used to illuminate entire buildings by incorporating them into the actual structural design, creating rooms that appear to illuminate from no particularly identifiable point. In fact, the small size, cool operation and low power requirements of LEDs are allowing some designers to do away with normal light fixtures altogether. 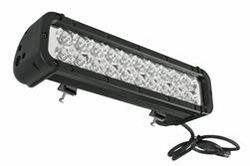 The durability and high efficiency of the LED has also made it a popular alternative in industrial and military settings with LEDs being applied to spotlights, armored vehicles, infrared visioning systems, hazardous locations and a long list of others related to heavy duty applications. Since LEDs first attracted attention as a possible replacement for the incandescent lamp, efforts have largely focused on improving output and efficiency in order to bring the LED to a level of practicality in par with traditional light sources. Naturally, this has resulted in the bulk of LED advancement and attention focusing on LEDs as a replacement for general purpose lighting. But LEDs have other traits besides high efficiency and long life that hint at potential far beyond that of just general illumination. Because LEDs emit light over a very narrow and specific part of the light spectrum, they can be used to produce light that is highly focused on only one color. Whereas an incandescent or HID lamp may emit light that is made up of red, yellow and blue parts of the light spectrum, LEDs emit light only within a specific part of that spectrum, effectively producing “purer” light than their traditional counterparts. This ability to produce light of only one color holds great potential for many fields, including agriculture, law enforcement, industrial manufacturing, and even health care. In agriculture, hydroponics and indoor gardening require light sources capable of supplying illumination tailored towards an ideal range of the light spectrum that plants favor. With LEDs, it is possible to produce precise light levels targeting specific parts of the light spectrum in order to stimulate best possible plant growth and crop yields. Even better, LEDs run a great deal cooler than the metal halide and high pressure sodium agricultural lamps they are replacing, reducing the need for expensive temperature controls to compensate for the increased heat created by lamps. In military applications, LEDs are rapidly replacing most traditional forms of lighting. On submarines, the US Navy has begun replacing notoriously noisy and poorly performing fluorescent light fixtures with LED equipped units. The result has been greatly improved light quality, significantly reduced maintenance costs, improved shipwide lighting efficiency and an overall improvement in crew morale. Another aspect of military performance where LEDs are making a big impact is covert operations and night vision applications. Where it was once necessary to use a traditional incandescent lamp or HID unit and outfit it with a special lens to produce infrared light, LEDs can be tailored to produce light specifically in the infrared end of the light spectrum. Larson Electronics infrared light bars for instance have been installed on everything from Humvees to tanks in order to augment existing night vision systems with great success. Even better, these installations entailed little more than mounting and adding an extra power wire for supplying current. Night vision equipment relying on ambient and infrared light benefits greatly and their performance is increased as LEDs produce more infrared light per watt, have no lens to diffuse or reduce overall light output, and last over 10 times longer than traditional lamp and lens units. They switch on instantly, unlike HID units which require a warmup period before reaching full power, and there is no additional lenses or covers to replace due to damage or loss of effectiveness. One of the more interesting and sometimes controversial subjects involving the use of LEDs is perhaps the medical field. Researchers have known for some time that light can play an important role in the performance of the human body. Tailoring office lighting to a more natural part of the light spectrum for instance, has been shown to improve alertness and productivity. This is the type of spectrum manipulation that has been used with some success in treating psychological and physiological problems such as depression and lack of alertness and energy. Other more medically direct methods of using light involve using the warming properties of far red light to stimulate blood flow and cell response to aid in healing injuries. In both of the aforementioned cases, LEDs are beginning to see increased experimentation and use as they offer a much more precise way of targeting the specific part of the light spectrum responsible for favorable responses. Possibly because of the promising results in some fields of medicine with using LEDs, other less documented or proven applications have also gained some popularity in alternative and spiritually based medical treatments. In some instances infrared LED lamps are being used to treat cancers and skin diseases in the belief that radiation from this end of the light spectrum has beneficial effect on managing abnormal cell conditions. This is a highly contentious practice as infrared light has not been shown to be of any benefit in treating skin cancers and may cause those seeking treatment to place too much reliance on such treatments in favor of established and effective procedures. There some practitioners who even goes so far as to combine spiritual and faith based healing beliefs with infrared light therapy, and it is these who appear to draw the largest criticism. While LEDs certainly hold a great deal of potential and promise for medical application, unless there is peer reviewed evidence for support, it is highly doubtful that such unproven therapies are of much benefit. It is probably wisest to not allow the excitement and newness of LED technology to color judgment when it comes to such serious medical conditions and instead defer to established medical practices for effective treatments. All in all, however, it appears that the potential of LEDs is still emerging and has yet to be fully developed. To list all of the varied applications where they now appear would take several long pages, which demonstrates just how effective their efficiency, durability and output truly is. If there is one thing that is established beyond any shadow of a doubt, it is that LEDs are here to stay, and the future of light producing technology will forever be changed by their presence.